One of my surprise finds at the recent Family Winemakers of California tasting in San Francisco was the wines of La Sirena. I began my two days of tasting focusing on just white wines and this was one of my first stops when I noticed winemaker Heidi Barrett was pouring. Heidi is a winemaking super star with a track record for making blockbuster Cabernets at places like Screaming Eagle, Dalla Valle, Rubicon and Grace Family. Today she is consulting winemaker at eight wineries including Amuse Bouche, Paradigm, Revana, Barbour, Lamborn, and Fantesca. But La Sirena is her personal project with husband and Napa Valley legend Bo Barrett, co-founder & winemaker of Chateau Montelena. When I asked her about this wine, Heidi said she wanted to do something fun and different from what she has done elsewhere. She was certainly influenced by the style of wines made from Moscato Bianco in Italy’s Trentino but Moscato Azul seems to be a fresh New World interpretation of this variety which almost always is made in an off-dry or sweet style in California. The grapes come from a vineyard in Calistoga near where La Sirena is made and the Barrett’s have their own vineyard. Besides the wine, the striking blue bottle and matching synthetic cork also make an impression. 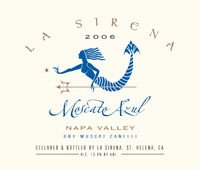 La Sirena, “Moscato Azul” Muscat Canelli, Napa Valley 2007 ($30) – Very light straw color in the glass with an explosively floral nose of mango, pineapple, orange blossoms and lychee. Light and clean on the palate with tropical fruit and citrus flavors finishing bone dry with good acidity. A truly unique white worth seeking out that would be an excellent match with brunch fare. Note: Since this wine was tasted at a trade event I’m only using my 5 star rating system.